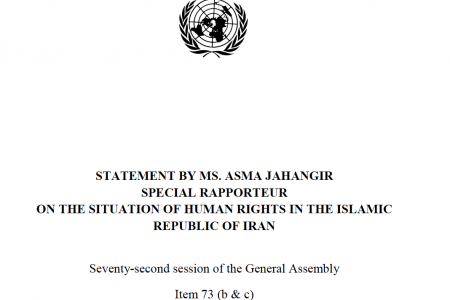 I am honoured to address the General Assembly for the first time since I took up my role as Special Rapporteur on the situation of human rights in the Islamic Republic of Iran, in November 2016. The report which I am presenting today covers the first six months of 2017. It is based on information received from sources both inside and outside of Iran, communications sent to the Government and responses received, the review of legislation, and consultations with various stakeholders including civil society organisations. I have highlighted a number of individual cases in the report after a process of verification and would encourage the Government and States to give their full attention to each one.